Speaking in front of people is usually perceived as the most stressful experience imaginable. 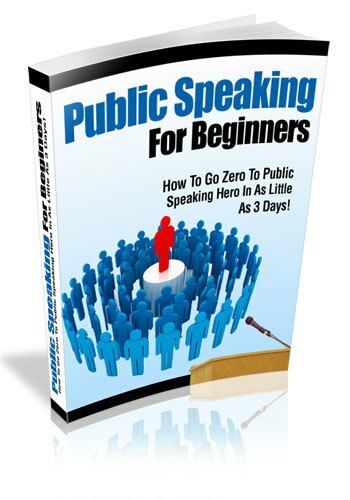 The ideas in this eBook are designed to help you, or anyone for that matter, convey your ideas and messages to either one person, or a large group in just about any setting. Creating an effective presentation can seem very overwhelming. But here are strategies you can use to come up with an effective and powerful speech in 30 minutes or less, regardless of your target audience. The one way to eliminate stress and fear before your presentation day is to rehearse. Consistent practice will not only significantly boost your confidence, but it will also help you remember and become more accustomed to your material. Let me run through with you the basic structure of a rehearsal. First, memorize your opening sentence. This is crucial as once you’ve got into the beat of things, you’ll realize that the rest flows in more smoothly. Next, memorize your main points in order of your presentations. Try to come up with acronyms for your points and run them in your head consistently while preparing. Also, remember your transitions. In between each point, remember your choice of transition into the next point. Relate your transition sentence to your main point and you will easily recall it during your actual presentation. Lastly, remember your stories. The best way to do so is not to create stories, but to use actual personal experiences. This way you won’t have to try to hard to memorize details and feelings, but the story itself will come naturally to you and even if you forget the flow of the story, you’ll have your memory to help you.